Stuck for gift ideas? Looking for a warm hug ? Want something to groom? Well, Trumpybear is the answer. 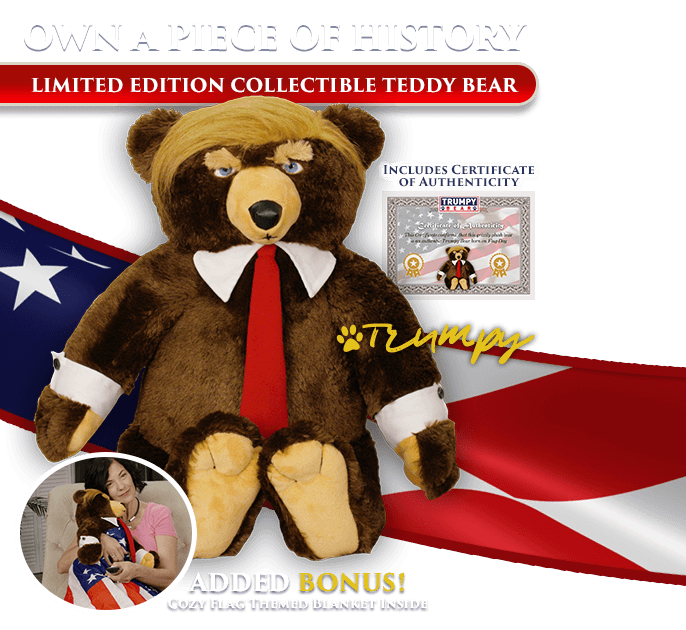 Trumpy Bear is a plush 22″ bear with an attached 28″ by 30″ flag themed blanket. $39.90 plus $6.95 shipping. Trumpy has a zippered neck where the blanket is stored. Texas residents will be charged sales tax at the rate of 8.25%- all other states are neither collected nor remitted. There is a 30 day money back guarantee for product price only. Shipping charges non refundable. Sorry, we cannot accept returns of intentionally damaged bears. Most orders are shipped within three business days. However, during periods of excess demand, please allow up to 6 weeks for delivery.